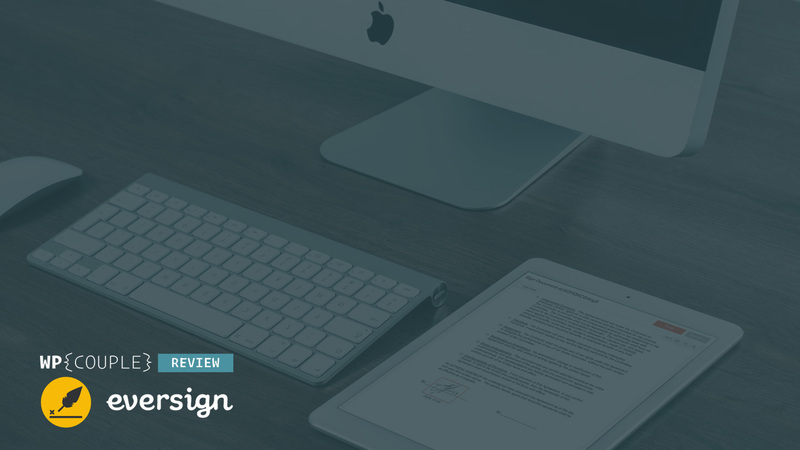 eversign Review — Go Paperless With eSign! Whether you’re a freelancer, an employer, or an employee, you must have to go through paperwork to keep the trail of all activities. It’s crucial to do the paperwork for many legal reasons and to be on a safe side. Otherwise, you might end up in hot water. If you do paperwork, like I used to do, you can imagine the responsibility and frustration which comes with it. You have to manage time to schedule meetings with people and get your documents signed. Eventually, you end up managing all of those documents. And sometimes, it’s quite frustrating to find the right document on time. Now for all of my contracts and other legal documentation, I use an online service called eversign. I have been using it for a long time now, and I could not be happier. It saves my time and boosts efficiency. Today, I have decided to write in detail about what features eversign has to offer and how you can implement it in your workflow. For this purpose, I will be setting up a new account and show you how you can get your first document signed online. So, let’s dive in! 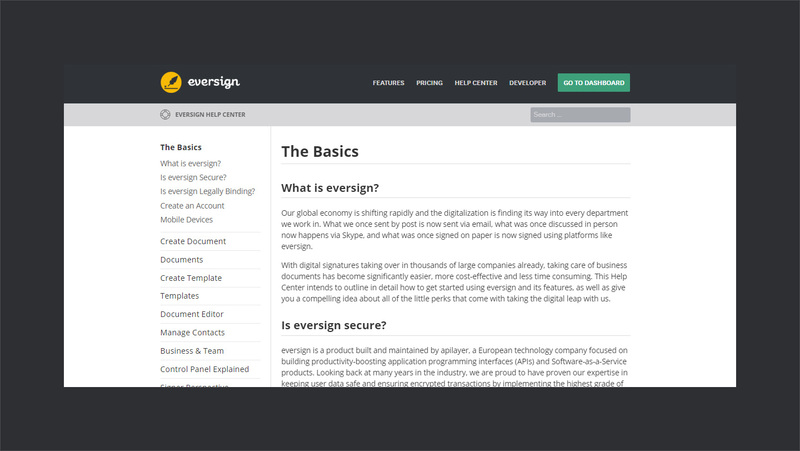 Founded in 2017, eversign is a SaaS product developed by apilayer. apilayer is a big name behind many popular & helpful APIs and SaaS products for developers. It was founded back in 2015 and have its office in Vienna, Austria. During this short span, they managed to build a solid product line and a good name. 🤑 currencylayer API – Reliable Exchange Rates & Currency Conversion for your Business. 📪 mailboxlayer API – Email Validation & Verification.  👾 giflayer API – Powerful Video to GIF Conversion. 🗺 streetlayer API – Real-time, International Address Validation & Autocomplete. 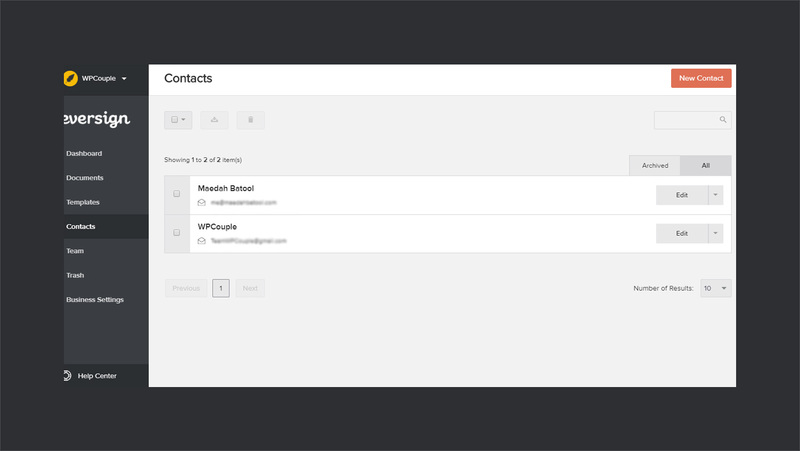 🔖 invoicely (SaaS) – A Powerful Invoicing Platform. Recently, we covered an extensive review for yet another amazing product by apilayer called the ipstack. This intuitive API helps you to geolocate and identify your website visitors. You can check out its features and working here →. 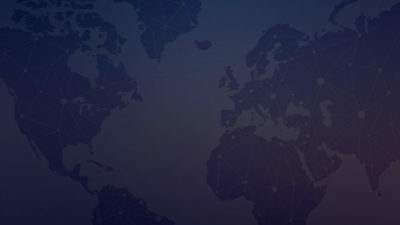 eversign operates in compliance with the requirements of the U.S. Electronic Signature in Global and National Commerce Act of 2000 (ESIGN), the Uniform Electronic Transactions Act (UETA), and the European Union eIDAS (EU No.910/2014), which are considered legally binding around the world. Being legally compliant, they can be enforced in a court of law. You can learn more about the legal binding here. They store all the documents on AWS Cloud and store the data indefinitely for legal reasons. All the data is secured via 256-bit SSL encryption.  You can always export your documents and remove all the data permanently from the servers. Also, it rocks other useful features like team management, contacts management, electronic signatures, a document editor, and much more. I’ll be covering more in detail later in this review. eversign offers one free and three premium plans for its customers. The Basic plans start at $9.99 per month, and it goes up to Professional Plus at $79.99 per month. With each plan, you get almost all the features except a few. For example, there’s no Custom Branding in the Professional Plan, and there’s no In-Person Signing feature with the basic plan. Apart from these, you have all features like templates, API documents, team members, integration, and premium support in all of them. They only vary regarding the quantity in each plan. And if you signup for a yearly membership, you’re going to get a 20% discount. eversign rocks a clean and robust user interface combined with great user experience. Which makes the onboarding process an easy job. Follow the quick steps below to get up and running with it. 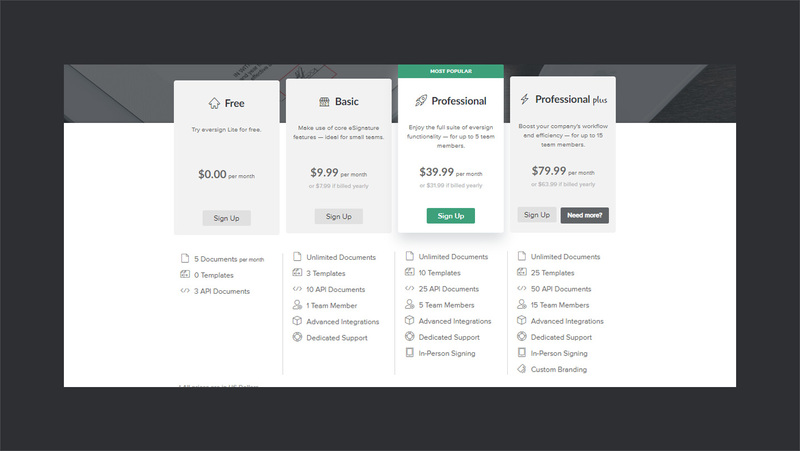 The very first step is to head to the pricing page, choose a plan, and purchase it. The signup process is a little different than usual ones. It’s a three-step process where apart from credentials, they ask for your details and business. As an individual, you can also skip the business part. After completing the registration, you’re all set to get your first document signed electronically. 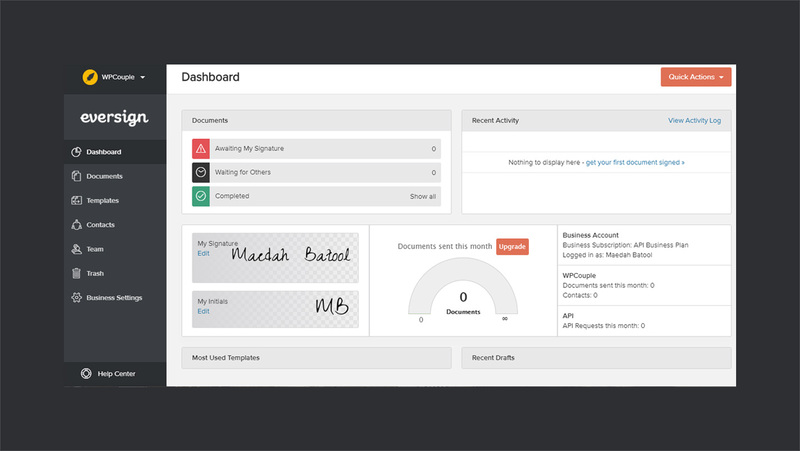 Log in to your account; it will take you to the dashboard of eversign. 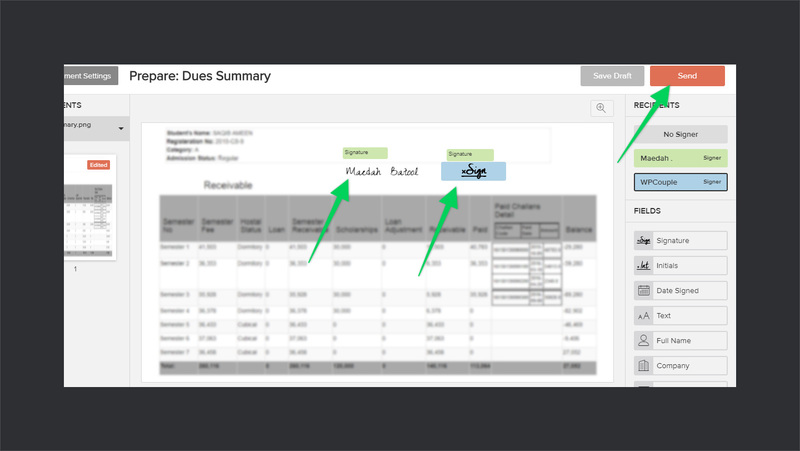 In the dashboard, you can see the overview of your account, all the documents signed/pending, and manage your signatures. It should look like something below. On the left sidebar, you have different tabs related to different features of eversign. Which kind of make sense and makes it easy to understand & use. So, to create your first document, navigate to the documents tab. That’s the place where you manage all of your documents — drafts, in the process, completed, and the one you needed to sign. To create a new document, click on the New Document button on the top left corner. It will take to the next page where you can add all the content you want and prepare it to send to your customer. This is the main step where you have got to add everything about your document. 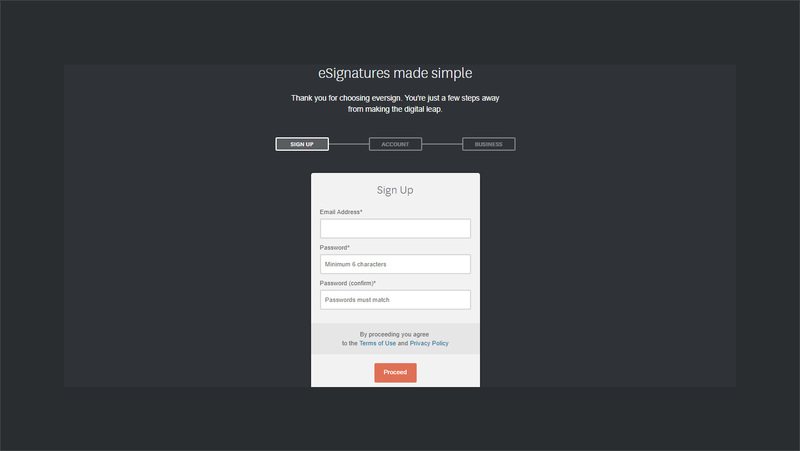 You need to add the signers, link the document, and CC as many people as you want. There are a couple of things to consider at this point, so let’s break it down. 👉 Me & Other is one of the options you might be using a lot. However, if you’re a legal advisor or a third party who handle such stuff for other people, you can go for Others Only. It’s another interesting use case by the way. For now, go for Me & Others and proceed ahead. After this, you need to upload the document to be signed. You can either upload or import one from Dropbox, Box, OneDrive, Evernote, Google Drive, Gmail, or Cloud Drive. Then add the signers or CC, add any message if you want to, and then click on Prepare. Once you’re done preparing your document, it takes you to the document editor. 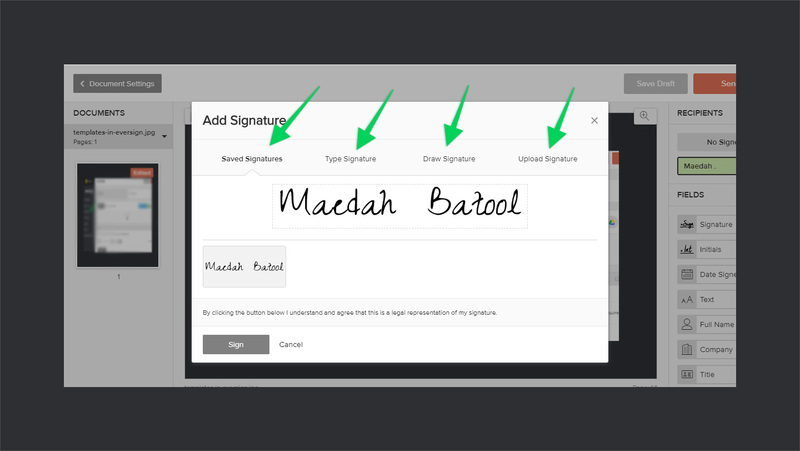 Here you can sign the document on your behalf, add custom fields, and add a place for other signers. Once you’re done hit the Send button, and you’re all set. All the people that you have added in CC and the signers will receive an email. If you’re a CC, it’s read-only for you. While the signers can sign the document right away without signing up for an account. Which is cool, I guess. As they don’t have to go through the trouble of signing up for the sake of just signing it. As you have seen, it is quite easy to get started with eversign. Now let’s move onto the other features which will find helpful while using it. Let’s jump in! While preparing a document you might have noticed that there is an editor available as well. Using the editor, you can add custom fields, attach files — which is a huge plus, add text, and do some other cool stuff. So what you can do is prepare templates for repetitive tasks like the hourly contract, NDAs, or any other stuff. 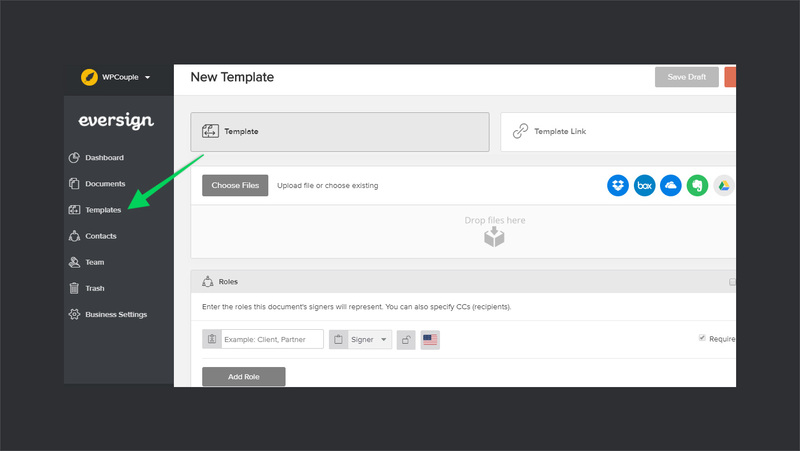 Once you have templates ready, you can use them to save your time in the future. Just edit small fields and send them within a couple of seconds. I personally have a set of templates which I use quite often. And even for templates you can import them from any place, maybe right a doc and upload it. A secret behind many successful products is their support team and documentation. Great documentation saves the user from the hassle of sending emails back and forth. And a good support team help you figure out things easily, listen to your feedback, and improve. 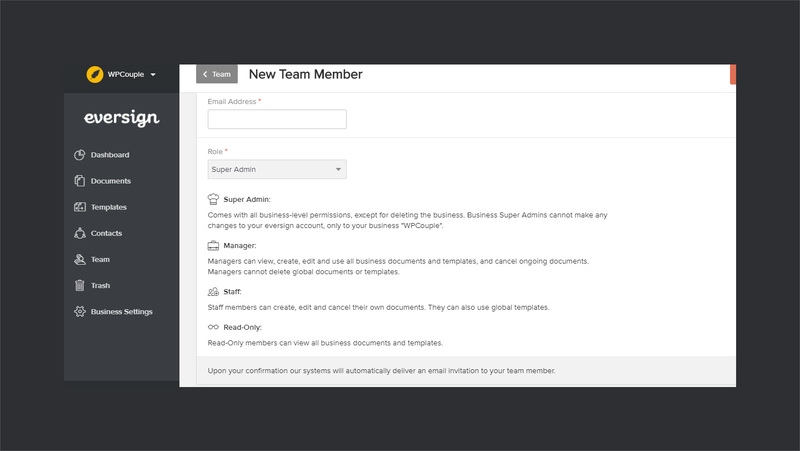 🌟 Super Admin: Complete business level access except deleting business. 💂 Manager: Managerial level access to all businesses except deleting global templates and docs. 👷 Staff: Can manage only their documents and can use global templates. 👁 Read-Only: Can only view all documents and templates. 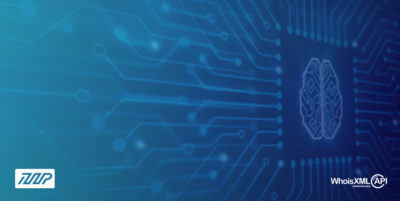 eversign comply with the General Data Protection Regulation (GDPR) to make sure your data is protected, and you’ve control over how your data is used. And again, you can always remove your data permanently by deleting your account. Also, eversign is HIPAA compliant and provide a workflow to work in a HIPAA compliant way. 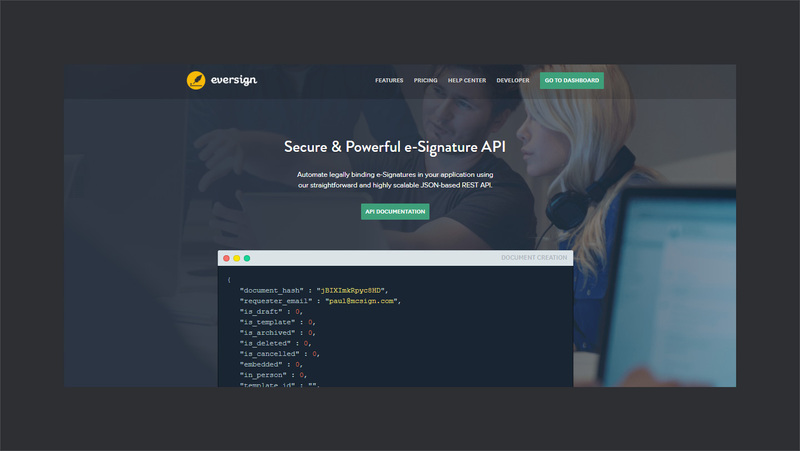 Last but not least an interesting feature for the developers is that eversign also provides a RESTful API. You can use the API to integrate eversign in your applications. It’s JSON based and is properly documented. There’s no free version; you’ve to purchase to use the API. eversign is a feature-rich product with strict legal compliance to help you go paperless. Tools like templates, editor, and team management help you save time and boost productivity. I consider eSign to be a crucial part of my workflow and rely on it on a day to day basis. So, if you are looking to effectively manage all of your documents and put your efforts into what matters, you should give eversign a shot. It worths your time and investment. Have you ever used eversign or any other eSign service? How was your experience? Let’s know your thoughts in the comments below. 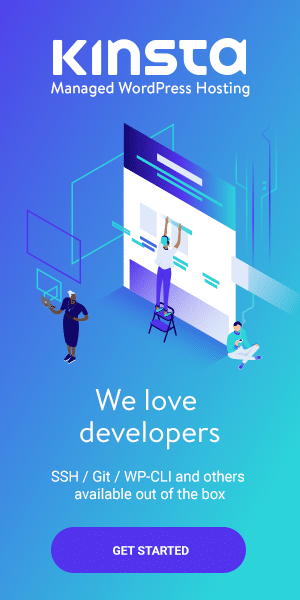 Kinsta’s New Multi-User Access Feature & We Love It!